Upcoming LELE training events, consultations and hands-on demos. Mulch Mow them in place to nourish your turf, trees, and landscape beds. 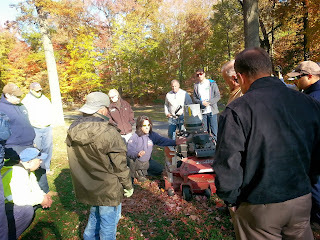 10/28/2013 - Mike Debartolo of Masonry Depot and Lynne Richy and the crew of Nature's Cradle demonstrated effective mulch mowing techniques with different kinds of mowers for the New Rochelle Parks Department and the Superintendent and Grounds Manager of the New Rochelle School District. NRSD will be mulch mowing on all ten school campuses starting this fall, and the NR Parks & Rec. 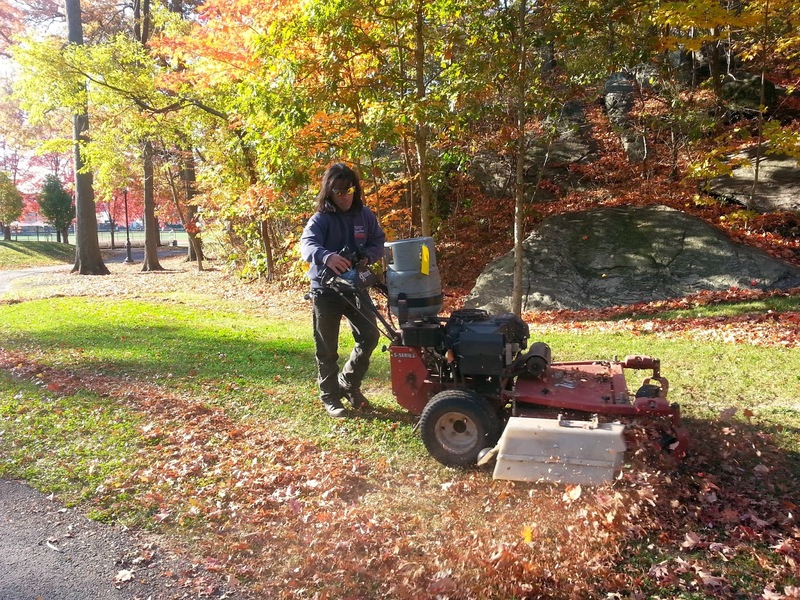 crews will be mulch mowing at several parks including Flowers Park and Davenport Park. Mike DeBartolo demonstrates the mulch mowing action of the Vulcher at LELE training at Flowers Park on 10/28/13. For more information about LELE training, on-site consultations, or if you have other questions, please email us at info@leleny.org. The LELE Toolkit resources are licensed for your re-use under a Creative Commons Attribution-NonCommercial-ShareAlike 3.0 License.